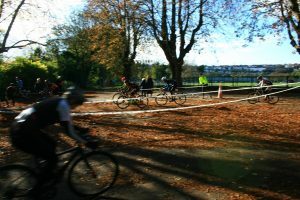 Coming from a mountain-bike background, I was subject to a fair amount of puzzled expressions and smart comments when I stuck a set of second hand cross tyres on my road bike to go to “watch” Cyclocross at East Brighton Park – You know, just in case I was tempted to have a go! My slightly [highly-Ed] competitive nature, coupled with a little peer pressure meant it was no surprise when I went into the pavilion to fill in my on-the-day entry. It was at this point that the weird feeling of excitement/trepidation/fear kicked in. My bike is a Specialized Diverge “adventure” road bike, but had never been anywhere more off road than a small stretch of the Downslink. The steep banks on the terraces of East Brighton Park filled me with fear and I had no idea how the bike would handle sharp corners on the grass. I went out for a lap before my race started and managed to make it up the slope after a few attempts (with some tips and encouragement from bystanders). This made me feel slightly calmer as I rode over to the start-line. Some of the girls were looking really serious as names were called out for gridding, the majority seemed just as nervous as me, but still chatting and wishing each other good luck. As I only entered on the day I was right at the back of the grid, which suited me, less pressure and worry about being in anyone’s way! 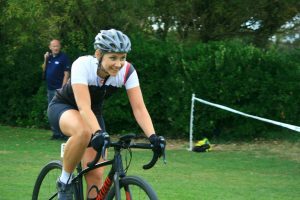 Once the race started I was able to overtake a number of people on the long grassy straights, my nerves quickly dissipated as the excitement and focus of racing took over. Once the Vet50 men started to catch us up it was a little more nerve wracking, but they were mostly good at giving notice of where they would be passing and knew to keep out of my way! The course was dry and apart from some ups and downs on the banks it wasn’t overly technical, no hurdles or mud, so it suited my lack of CX skills. There were a few sections I didn’t ride and lost time with my slow dismounts and remounts but managed to finish 4th in my age group. I was really happy with this! 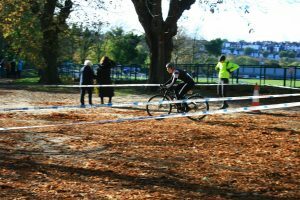 My second race of the season was at Preston Park which was a little more technical, with some roots and sharp corners through the trees. There had been a little rain but luckily for our race it hadn’t reached through to the roots! 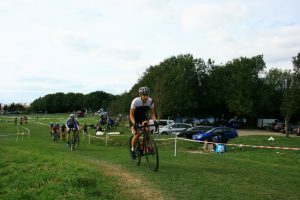 There was a log and a steep bank, as well as a few surface changes from grass to the tarmac of the velodrome and some tight turns to negotiate. 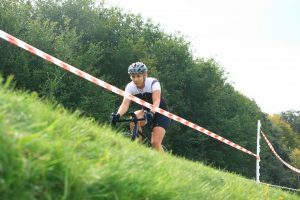 I managed one ridiculous fall when trying to remount after the slope, got totally tangled up in my bike and twisted my saddle to an awkward angle for the rest of the race. As you’d expected my snap-happy friend was waiting to capture the whole incident in a series of photographs! Despite this I finished with a 2nd place in my age group. I stayed to watch the seniors race and the heavens opened just as they started, which meant a lot more falls, mostly just sliding out on the wet grass, I was really happy us women had the nicer conditions but you can really learn a lot from watching other riders. East Brighton Park was the venue again for my third race, the course was different and there had been a bit more rain by this time so the top part, a straight, but cambered section under the trees was a little slippy, my tyres didn’t seem to get much grip so I had to pedal smoothly and slowly to not slide down into the bushes. There was a huge bank that a few of the vet 40s before us had been riding, but fair few of them were getting half way up and tumbling all the way back down – the more sensible were just getting off their bikes and climbing it, which looked hard enough in itself! The get off and climb option was the one I took, despite the constant cries of “Ride it,Ride it” from the crowd gathered around it. The heckling for this race was top! The kids were even asking people’s names and personalising the shouts the next time round, so much fun! A 3rd place gave me some money to treat some of my hecklers to a coffee while we watched the seniors, some of which were even managing to get air at the top of the big slope, goes to show what you can do with some speed, bravery and commitment! 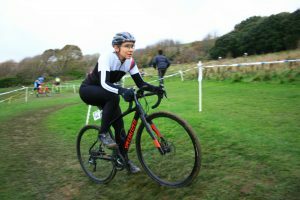 My next race was at Frylands, I’d seen photos of my friend after last years race, caked in mud and with snow in the background, so after sliding around at East Brighton I decided it was time to get some better mud tyres! 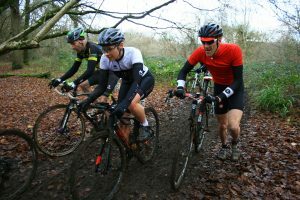 As we pulled into the carpark there were a number of people pushing or carrying bikes, riders and bikes carrying the hallmarks of cross, mud, cuts and broken mech hangers… This should be my first REAL experience of cyclocross in all its muddy glory! The first lap wasn’t too bad, the gravely climb at the start was good but after a technical rooty bit there was a long, gradual climb that in dry weather would have been a doddle, I started to ride up it but quickly realised that my bike was starting to clog up with mud and some of the girls were passing me on foot, despite being a terrible runner I shouldered my bike and joined them. By the time I got to the top I could hardly breathe, my calfs were burning and I’d tripped over already, This was not going to be my kind of race! The areas where the mud was a little softer were ok to ride as it fell off of the bike, these bits were fun, and I nearly slid out on a few corners but was quite cautious and stayed upright. The parts that were stickier just meant the mud built up around my front mech and chainstays – the tyre clearance on the Diverge isn’t great and I had to stop regularly to poke huge lumps out – otherwise the wheels just wouldn’t turn. By the third lap I had virtually given up trying to ride! I thought about scrapping the race completely and walking back down the hill but in the spirit of things (and because we’d driven 60 miles up here) I thought I should probably finish. I could have walked that last lap faster and I limped home in virtually last place, but at least I finished. It ended up being a very long drive for a very short ride, but getting to spend time with my friends, and meeting even more friendly and encouraging people meant it didn’t feel like a wasted trip. 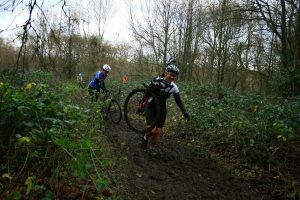 Cyclocross may be a ridiculous sport – “a good ride ruined’ or “the wrong bike for the job” but it is weirdly addictive! This is mostly due to the people involved and I’d like to thank everyone in the community for putting the time and effort into organising the events, making me feel welcome and offering advice and encouragement – I hope I’ve given you a few laughs along the way! Intro, edit and photos by Glen Whittington.